Custom thermoformer will showcase medical packaging and enclosure innovation at MD&M West. ...we hope to inspire attendees as they set out to discover new ideas - and address new challenges - so they can leapfrog their performance in 2019. 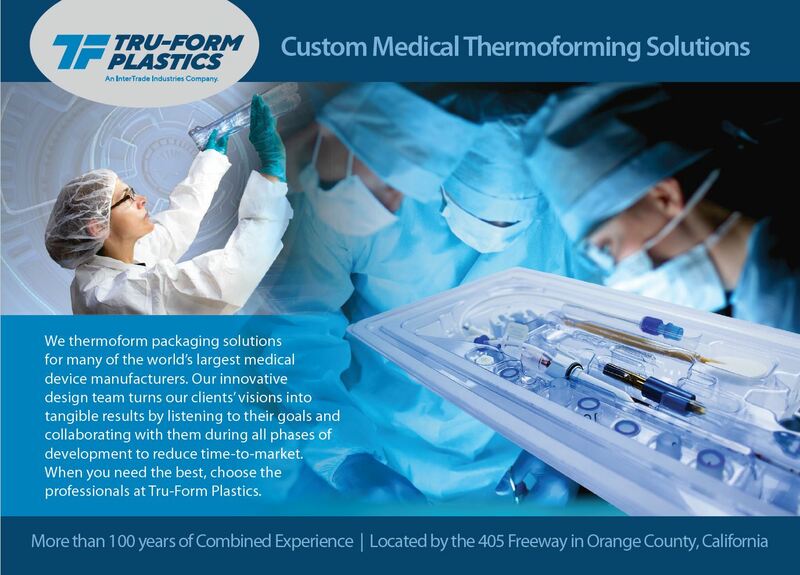 (1888PressRelease) January 31, 2019 - WESTMINSTER, Calif. – Full-service custom thermoformer Tru-Form Plastics, an InterTrade Industries Company, is bringing its innovative medical packaging and enclosures to MD&M West February 5-7, 2019, in Anaheim, California. Exhibiting at booth #1554, Tru-Form Plastics will display a selection of its custom-designed heavy and thin gauge thermoforming solutions and share how its creativity, flexible methods, and collaborative approach are central to delivering solutions that fit the unique needs of the medtech industry. With these comprehensive capabilities in house, Tru-Form Plastics is well-positioned to exceed customers’ expectations for innovative, reliable, and functional solutions, including thin gauge plastic packaging items like trays and clamshells as well as medical device enclosures made of heavy gauge plastic.